InfoQube is an in-development information manager with an interesting backstory. In the 1990s (centuries ago in Internet time), there was a powerful, flexible, PIM tool called Ecco Pro. It was so well-liked that Microsoft incorporated many of its features into Outlook, which it then proceeded to give away. Ecco partisans never quite gave up, and the program still has loyal followers. InfoQube is heavily inspired by Ecco, which somewhat colors its design decisions and feature set, but goes far beyond it, offering such features as an HTML editing pane, fully functional Gantt charts, advanced filtering and grouping, tabbed workspaces, and remote data access, to barely scratch the surface. But how well does it work for someone who did not use the software that inspired it? “Somewhat confusingly” is the answer. 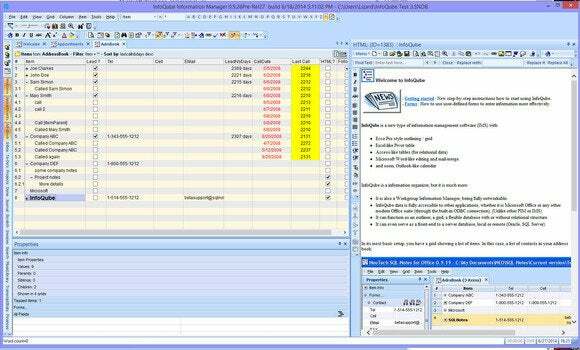 I approached InfoQube as a user of outlining/data management tools. It works in these categories, but it has a lot of other features that extend what you can do with it—but these features are intertwined with interface paradigms and assumed usage patterns that are not mainstream. 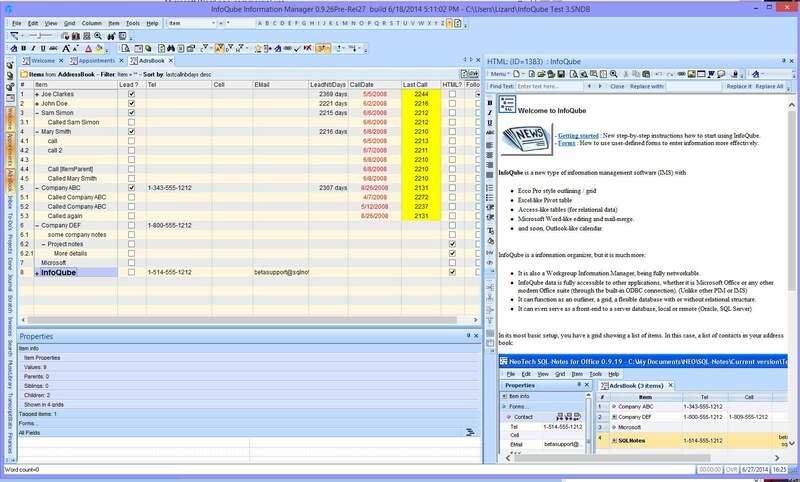 A typical InfoQube grid, showing nesting, HTML notes, and multiple fields per item. 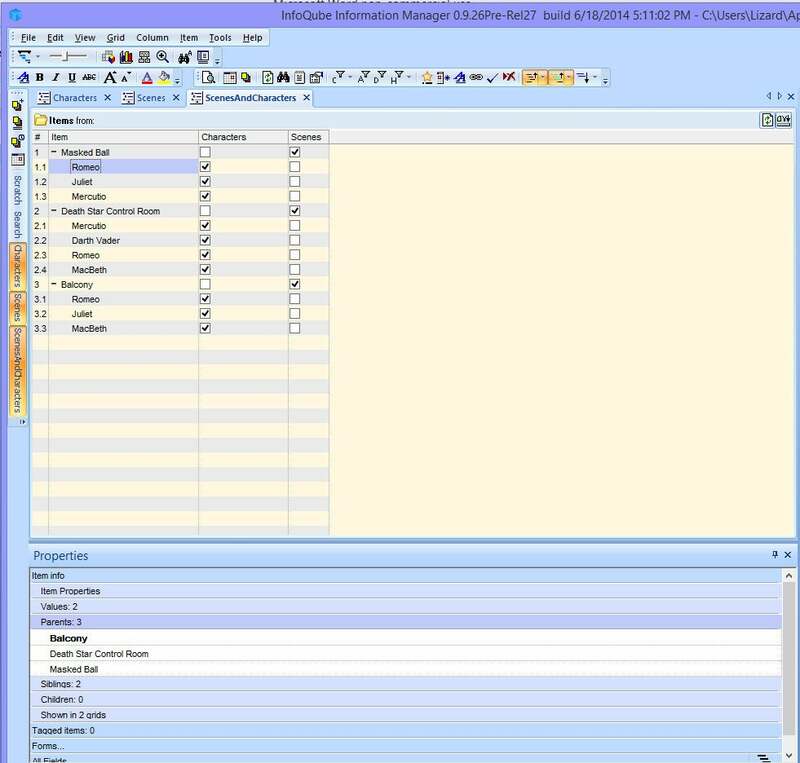 The primary interface for InfoQube is the Grid, which contains items (rows) with fields (columns). 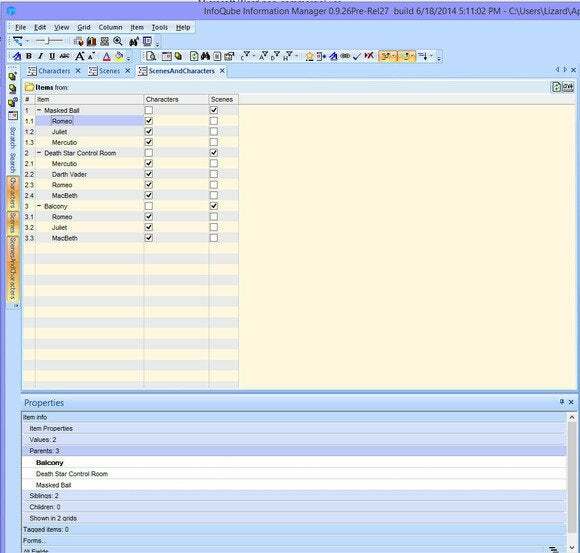 You can have many grids open concurrently, each containing different items and columns. 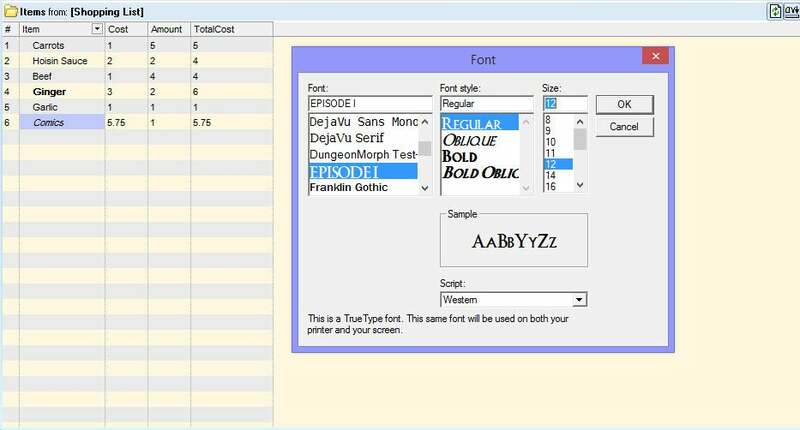 Using only a single grid and the default column of “Item,” InfoQube works well as a two-pane outliner with several advanced features, such as multiple parents. A single item can be placed into many positions in the hierarchy by using the Ctrl key to drag it around. Items can have multiple fields, including calculated fields. Each item is also associated with an HTML object, which is edited in a WYSIWYG style, and includes a good range of formatting options. InfoQube offers standard font formatting, but oddly uses a modal dialog to present it. Diving deeper, one can find a whole range of functionality and possibilities. Pivot tables (a component must be downloaded from Microsoft to enable them; this is free), summary fields, date and time functions, advanced filtering, and sorting options. One of the more complex concepts that must be learned to take advantage of InfoQube is that data items do not “belong” to grids. Grids display items, and, by default, every item created in a given Grid has a custom fields whose name matches that of the Grid. If you create a Grid called “Contacts,” each item created in that Grid has a field called “Contacts.” This makes a Grid something like a table in a traditional database—but not completely. Any given item can have any arbitrary set of fields, and what’s displayed in a Grid is determined by the “Source” setting for the grid, along with the filter options chosen. This flexibility offers a lot of power, but it also requires a real understanding of how things work, or what you see in a Grid might not be what you expect. InfoQube lets you place a single item under multiple parents. Overall, “not what you expect” is something of a recurring theme. It took a while to learn how things worked, to figure out the best way to create and populate grids, and then to do things with the data. Part of this is to be expected when learning a new program, but it’s compounded by somewhat spotty documentation that sometimes assumes more context than a new user might have, and by bugs and inconsistencies. Sometimes grids auto-refresh to reflect changes; sometimes, they don’t. There are no warnings if you enter an invalid equation. The richness of the options and the amazing flexibility offered to a user who is clever about defining grids and fields makes InfoQube intriguing to the kind of computer user who enjoys working with complex things. There is an active development process and a small, but very passionate, community. I encountered multiple problems during the review process and got rapid, helpful, responses. InfoQube could be particularly useful for people who need a flexible outlining tool that includes time tracking and calculation functions, and who are willing to expend the effort to learn its intricacies. I experienced one incident of data corruption. I couldn’t replicate it, but that’s something to be wary of. Currently, InfoQube is scheduled for an end of 2014 release, at which point it is expected to cost $50.00. The pre-release versions have a 60-day time limit and are free. InfoQube is still in a rough state, but it's worth tinkering with due to its potential.